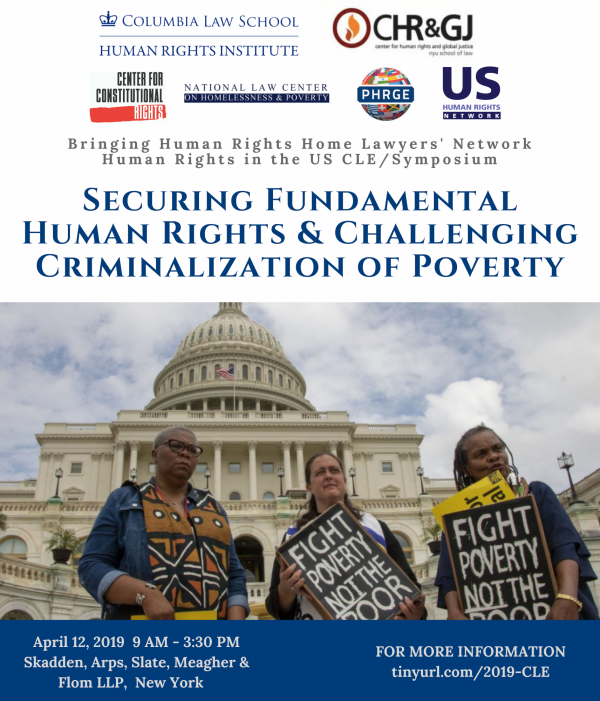 CHRGJ is proud to cosponsor the 2019 BHRH Lawyers’ Network Annual Human Rights in the US Symposium/CLE along with the Columbia Law School Human Rights Institute, the Center for Constitutional Rights, the National Law Center on Homelessness & Poverty, the Northeastern Law School Program on Human Rights & the Global Economy, and the US Human Rights Network. Skadden Arps is our generous host this year. Focusing on the case study of criminalization of homelessness, this opening panel will highlight how local and national organizations have used an array of human rights standards and strategies in advocacy, organizing, and litigation to challenge the criminalization of homelessness. Speakers will discuss the human rights law and principles that inform this work, identify specific ways to bring human rights into domestic policy spaces and movement-building, and discuss specifically how engagement with UN treaty bodies and independent experts has been used to move the needle to advance the right to housing. The ability to enjoy an adequate standard of living free from discrimination is a bedrock of human rights. Laws and policies that criminalize activities of daily life and penalize the inability to afford basic services contravene core economic and social rights protections and deprive individuals of basic needs, including in the arenas of water, sanitation, and health. Increasingly federal, state and local policy seek to deter access to basic social protections and stigmatize recipients of public services, with a disproportionate impact on communities of color living in poverty, as well as immigrant communities. These efforts violate principles of equality and non-discrimination, with impacts on the full range of human rights. This session will explore how the human rights framework can be used to analyze and challenge laws that curtail access to a social safety net, and penalize individuals who seek to engage in daily activities, such as driving or receiving public benefits. Panelists will discuss the short and long term impacts of criminalization, highlight emerging human rights strategies to raise the visibility of key community concerns, forge partnerships, and center the perspective of communities most impacted by rights violations. Across the country, women have been prosecuted for ending, allegedly causing harm, or merely risking harm, to their own pregnancies. Punitive child welfare practices further undermine rights to health, privacy for families. Existing laws and enforcement schemes violate rights to equality and autonomy and undermine public health goals. Lawyers and organizers have engaged with human rights standards and mechanisms to highlight the interrelated rights violations that pregnant people and families experience, as well as the how these laws impact women differently on the basis of their identities. Panelists will explore the human rights principles that motivate their work, discuss work with UN Special Procedures, and Treaty Bodies, and share how this engagement informs advocacy and litigation. Conference materials will be distributed to attendees. Printed review copies of the materials will be available at the conference. Registrants can request a printed copy. Please note that all rates are ‘per person’ and, as flat fees, cannot be prorated according to attendance. The CLE is free for attorneys and persons who are serving in public interest organizations (including government, academic, and non- and not-for profit organizations) or are experiencing financial hardship. Persons seeking a hardship scholarship should register using the online link above and then separately complete their registration by submitting a scholarship request, no later than April 4th, 2019 to the Human Rights Institute at hri-cle@law.columbia.edu. Requests, which will be answered, should detail in a few sentences the basis of the applicant’s need and the background to his or her interest. Please understand that without a complete scholarship request, the applicant may be notified that the scholarship registration has been cancelled.